Graphic Controls manufacture over 80,000 different Industrial Recording Charts and Pens to fit many types of Industrial Chart Recorders. 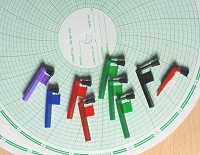 The Chart and Pen Book shows a selection of our Charts and Pens for common OEM's and Recorder Models. The Marking Systems Catalogue is a comprehensive cross reference between each OEM's Industrial Chart Recorder, the OEM's Pen Part Numbers and Graphic Controls's own Pen Range. 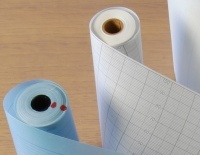 The Chart and Pen Book and Marking Systems Catalogues only shows a fraction of the 80,000 different industrial recording charts and pens available from Graphic Controls.